From the point of view of the human experiences we can observe no separation between the energy, the consciousness and the physical body, they form an unique, unified system. All three forms of this system are interconnected and interdependent on each other and it influences the other in a holistic way. Becoming aware of this system give us the possibility to transform, acquire and release more life force and creativity in our daily life. Becoming aware of our Energy-Consciousness System (ECS) means becoming more present and embodied in ourselves as well as deeply grounded in our creative power. More we are aware of our ECS more we can expand our boundaries and our state of consciousness. Trough this process of conscious awarenesses we can choose a better identification of who we are and how to connect to and realize our soul’s most deep longings. The intention of this experiential workshop is to support you on your journey of self- development in a frame of safe sacred space where any kind of topic and need’s are welcome. In this safe space, facilitated by experienced team of healers and therapists, you will get the opportunity to have a deep introspection into your inner landscape, and explore how your ECS functioning, how to increase your self-awareness of the ECS and how to use this resource for your wellbeing. You will have the possibility to heal your non functional believes, images and block’s and experience the flow of your life force. “The Flow of the Life Force” workshop is located in very cosy and comfortable place surrounded by beautiful nature, where the group work will support you with kindness, compassion and non-judgemental approach. We facilitate you to let go of your fears and shame, so you can become more aware of who you really are. 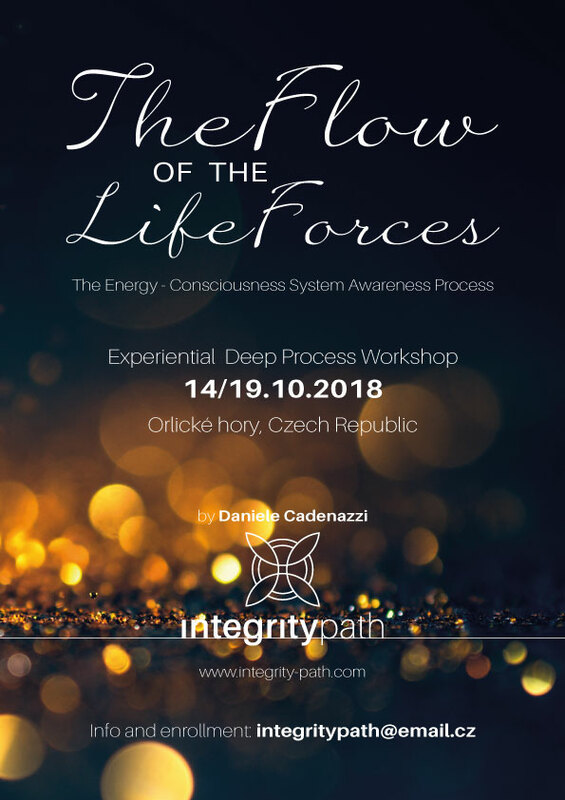 “The Flow of Life Forces” it’s a new “wave” for the Integrity-Path workshop. We decided to follow a less specific topic \ theme and give more space and focus on where will the energy of the present moment lead us. Our intention is to give more opportunity to the participants to bring what they need, what they would like to explore according to their energy and the group energy, rather than to focus us on one single topic. Cost will include your meals, accommodation, workshop expenses, and a minimum teaching donation. Understanding that each person has unique financial circumstances, I would like to ask you to consider what you are able to give in addition to the minimum. Daniele M. Cadenazzi, BHSP, MSc. Psychodynamic integrated body expression therapist, trainer, facilitator and healer. He has a therapeutic practice in Bellinzona (Switzerland). Through the advice psychodynamic integrated body expression, he offers services aimed to support and facilitate people on the path of self-knowledge and exploration of self, necessary to solve and transform blocks, trauma and non-functional dynamics, and to liberate and integrate innate creative resources in the human being. His passion is to work with people to help them discover their talents, quality and authentic expression. His desire is to support you in exploring your emotions and deepest needs, helping you to discover and manifest your essence, your qualities and your life purpose. Through this work, your problems, your emotions, pain, fear and wounds that have been limiting you will become the “unification points” through which you will be able to become more alive, to gain more awareness, to hold more love for yourself and others, and experience pleasure, fullness and well-being. Daniele graduated from Barbara Brennan School of Healing Europe (A-D) and has a Master of Science Degree in Complementary and Integrated Psychosocial Health Science from Gratz – Seggau (A). He has been offering seminars throughout Europe for over 10 years.